Here is a very belated post to share photos from our third time participating in the Nottinghamshire Pride Parade in July. I started the morning by arriving early to meet people who wanted to join BiTopia for the parade through the city centre. I know there are reservations and criticisms regarding the commercialisation of Prides (which I share too) but I still love to see local and national businesses put signs, flags, and rainbow coloured items on display. It makes me feel more supported, fosters an atmosphere of celebration, and raises awareness in the city centre that Pride is happening. The photo shows four business decorated for Pride. A brightly coloured rainbow display in a local bead shop, a Costa & Sainsbury’s with banners, and the Hartley’s cafe cow wrapped in a rainbow flag. As we stood waiting to set off we passed around signs, flags, banners, whistles, etc. and took photos of each other. There was a great buzz in the air as the fire engine drove into place and the samba music began – and then we were off! One thing I love about Nottinghamshire Pride is that the city is so small the parade effectively shuts down all pedestrian streets through the centre making us very visible. People have to see and hear some our messages. They have to wait for us to pass. It is a wonderful (albeit brief) take over. For me this Pride felt different from previous ones I’ve attended. It felt more inclusive of minority groups within the LGBTQ+ umbrella that are normally ignored, erased, and discriminated against as QTIPOC Notts and Notts BLM led the parade followed by local trans and bi groups. This was the first time I have ever seen a BME group lead a pride parade. I hope it happens more often in the future. BiTopia attendance was difficult to count as many people were there holding signs and flags to support and represent more than one group which was great to see. There was also a minutes silence for victims of the Orlando shootings which happened the month before. As usual I have barely been able to find any photos of the bi, trans, QTIPOC and BLM groups in the media. This erasure angers, saddens, and disgusts me. However BiTopia flags and members are visible in the background on the ITV news website, and there is a photo of QTIPOC members and the Chameleons banner there too. Communities Inc also have a shot of BiTopia members and a very brief video clip of BLM leading the parade. 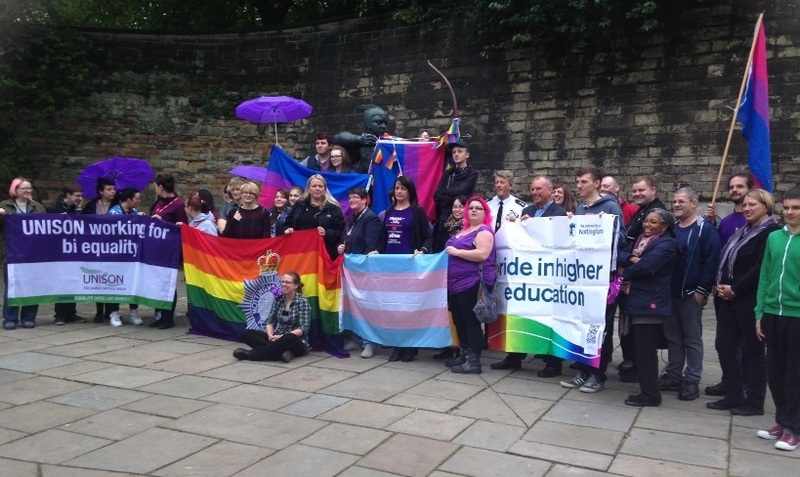 The Notts Post website has a photo featuring a lot of trans groups and trans flags. The first photo shows my view of the front of the parade waiting to set off. Everyone is facing away from the camera. Bi, trans, and rainbow flags are visible. There are signs against bi erasure. Intersectional signs with messages such as ‘Black Lesbian Lives Matter’ or ‘Black Nonbinary Lives Matter’ are also being held in the air. After the parade BiTopia members met up in various different venues around the city centre to socialise. I have now left the area so this will be my last Nottinghamshire Pride for a while but I am really proud of what we have achieved over the past 3 years and have many great memories. Thank you to everyone for your support during these last three Prides. If you still live in the area you are most welcome to join BiTopia for Pride in 2017! We have a new group leader to organise the monthly pub socials (and other events) for BiTopia. His name is Pete, and you can reach him by emailing nottinghambitopia-atsign-gmail.com if you have any problems or questions, or just want to chat to someone about the group. We’re sure he will do a great job in keeping the group going and we wish him every success for the future. We would like to say thanks to Pete and all the other attendees/volunteers who help out with the group for giving up their time to keep BiTopia running. We couldn’t do it without you! July Pub Social, Thursday 9th July, The Lord Roberts Pub, Broad Street, Nottingham, NG1 3AN. 7:30-11:00pm. Look for the rubber duck on the table to find us! Nottinghamshire Pride Parade, Saturday 25th July. Meet us at the corner of Listergate and Castlegate at 11:00am. More details below. Many BiTopia attendees will be going. August Pub Social, Thursday 20th August. Same times and place as the July pub social. Please note the change of date.This has been pushed back a week because of BiCon 2015. I would absolutely love to match the amazing turn out we had last year. Let’s put some purple into Pride and remind everyone bisexuals exist. Unhelpfully, that’s all the info they’ve provided! So let’s meet at 11:00pm on the corner of Listergate, Albert Street and Castlegate. If you came last year, it will be the same place we met last year. If you didn’t come last year, walk down Albert Street from St Peter’s Square as if you’re going to train station. The parade start point is the first crossroads you’ll come to. You will be able to find me very easily. I will be the person with long brown hair and specs carrying two washing poles and a banner! I’m going to get a banner with the BiTopia logo printed on for us. Please can you bring whistles, flags, poi, etc. I’d suggest wearing flat, comfortable shoes if you’re walking. Please wear purple if you can! Access: As soon as I know the route map for the parade I will post it. Last year the road/pavement surfaces were quite smooth and flat and there were no steps, however the parade did go up and down some slopes on streets like Pelham Street. After the parade we can go and get some food and drink somewhere to unwind and relax. 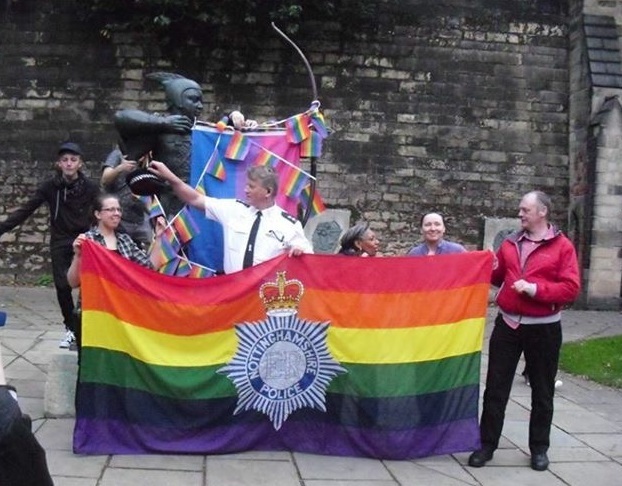 This year there will be a ‘stream’ in Nottingham city centre on Sunday 17th May for IDAHOBIT. Join forces with us as we try and get as many people as possible to ‘stream in’ to the Brian Clough statue in Old Market Square from different starting points. The stream I’m co-leading will start at The Lord Roberts pub. Please meet us there at 12:30 and bring rainbow/bi/trans etc. flags or whistles or signs to hold whilst we walk to the statue. 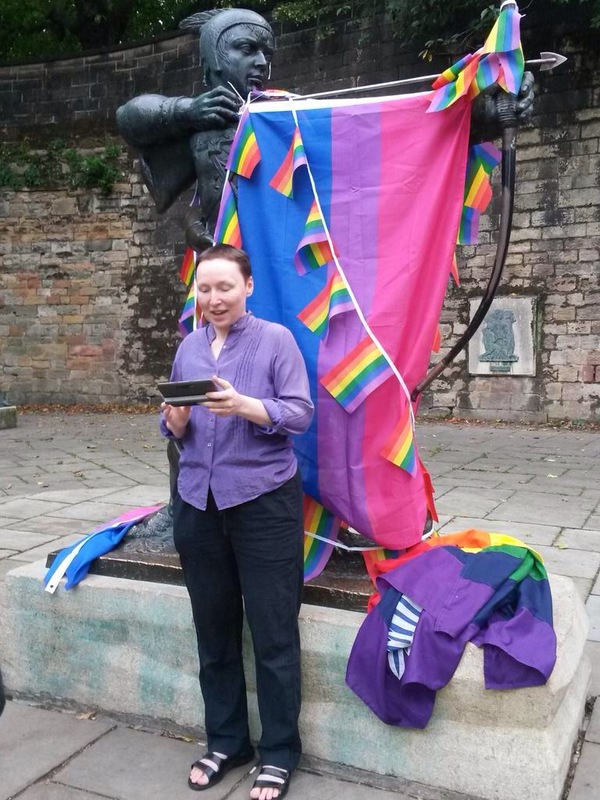 After speeches at the statue from 1pm, there will be various LGBT activities held throughout the afternoon. Nottingham BiTopia will go for a picnic if the weather is nice! There will also be an after party at the Foresters, or a showing of Milk at Broadway. Just in case some people reading don’t know, IDAHOBIT stands for the International Day against Homophobia, Biphobia and Transphobia. It happens on 17th May to commemorate the World Health Organization’s decision in 1990 to declassify homosexuality as a mental disorder. One activity that usually happens on the day is that local services, groups, businesses and organisations fly a rainbow flag to raise awareness and pledge their support to help stop violence and discrimination against LGBTQI people. Some people/groups/organisations still call it IDAHO or IDAHOT day, but if they do please point them in the direction of the official website. 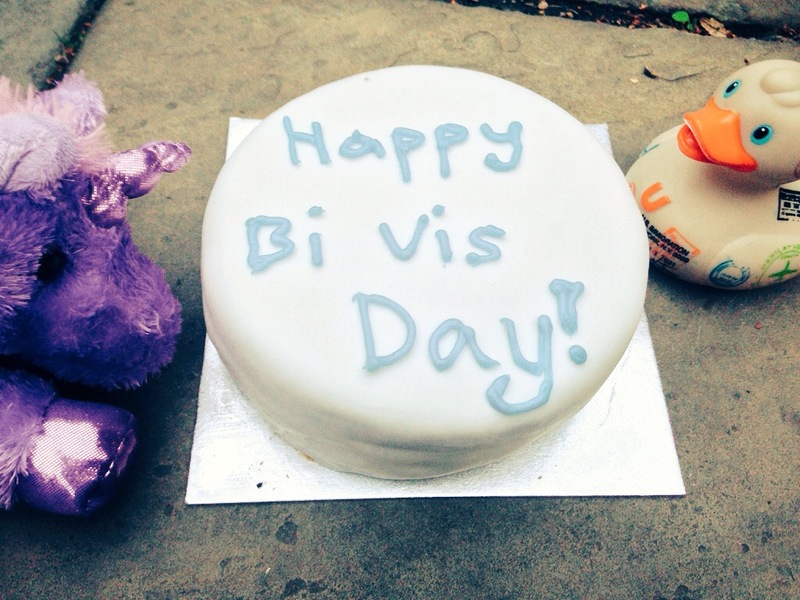 2015 is the first year bisexuals have (finally!) been officially included! IDAHO was created in 2004. “In 2009, Transphobia was added explicitly in the title of the name, in the recognition of the very different issues at stake between sexual orientation and gender expression. “IDAHOT” became another popular acronym used alongside the initial one. This year, emails and Facebook groups about the events happening in Nottinghamshire for IDAHOBIT originally used the acronym IDAHO. 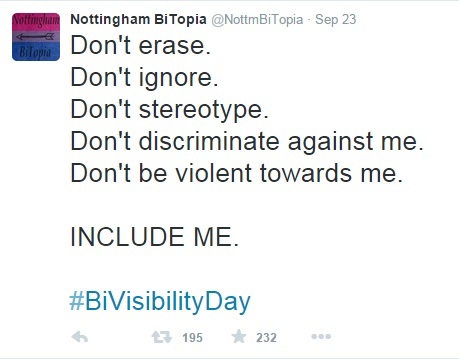 These have now been changed to IDAHOBIT, along with wording that goes beyond just mentioning gay, lesbian and homophobia, so it is worth pushing for a name change for bi and trans inclusion if you have the spoons. I’d like to say a huge thank you to Richard Townsley for being the main organiser behind the flag raisings and other events happening in the county for IDAHOBIT. He’s put so much time and hard work in. I have a lot of respect for him and the work he’s doing. Thanks to everyone else who’s helping and putting their time and resources in as well. Whether you are able to organise or take part in an event or just mention IDAHOBIT on social media, these links are a great place to start.